Throughout the last two decades state after state has passed renewable energy standards, often with big bipartisan majorities, as investment in technologies like wind and solar held great promise for economic growth and job creation in addition to cutting greenhouse gas emissions that drive climate change and decreasing air pollution. But in the last few years, pressed by fossil fuel businesses such as Koch Industries and advocacy groups funded by the Koch brothers, including Americans for Prosperity and the American Legislative Exchange Counsel (ALEC), bills have been introduced in state after state to repeal these standards. And in a few states, such as Ohio and West Virginia, they've succeeded. Now Kansas is following in their footsteps. This week the legislature voted to repeal its mandatory renewable portfolio standard (RPS), passed in 2009, and replace it with a voluntary standard. It passed overwhelming, 105-16 in the Kansas House and 35-3 in its Senate. The legislation is now headed for Gov. Sam Brownback's desk, and he's certain to sign it, given that it was unveiled at a press conference last week held by Gov. Brownback and legislative leaders at which he said it "further solidifies and stabilizes the policy environment so that investment can continue in Kansas." The Wichita Eagle noted that Mike Morgan, a lobbyist for Kansas-based Koch Industries, was also present at the news conference. The bill, SB 91, is being touted as a compromise. While it replaces the mandatory standard, which required utilities to generate 20 percent of their electricity from renewable sources by 2020, with the voluntary one, Kansas' burgeoning wind industry staved off a proposed 4.33 percent excise tax on wind production. The bill also shortened the lifetime property tax exemption for businesses using renewable energy sources to 10 years. The deal was struck in a series of closed-door meetings with legislators, the conservative Kansas Chamber of Commerce, Americans for Propserity and wind industry representatives. 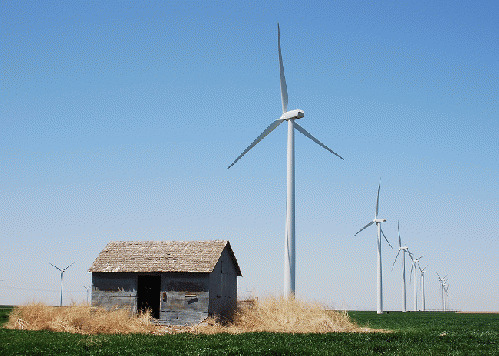 Kansas is already a national leader in wind generation. Last year, wind provided more than 21 percent of the state's electricity, exceeding the 20 by 20 standard. According to the Wind Coalition, it has created 12,000 jobs in the state. "The wind energy industry has been an economic and job growth engine for Kansas," said Wind Coalition spokesperson Kimberly Svaty. "We are pleased that an agreement was reached that will provide investment and policy stability so Kansas can continue be an industry leader. We are always willing to come to the table with anyone who is willing to recognize wind energy's economic benefits." But the group's executive director Jeff Clark acknowledged, "It's a step back from what we have now." Environmental groups, who were not at the table when the legislation was crafted, were not so upbeat. Zack Pistoria of the Kansas Sierra Club called it a "backroom deal," and said, "Our state is riding the brakes while other states are hitting the gas pedal -- Nebraska, Oklahoma, Iowa. They're going to have a competitive edge. Now's the time to double down on renewable energy, not double back." He pointed out that the wind industry's involvement likely resulted from their effort to stave off the excise tax, which could have crippled it. Americans for Prosperity, which had called the Kansas Renewable Portfolio Standard an "unaffordable mandate [that] merely drains family budgets, promoted by "powerful environmental interests," expressed delight at the repeal. "This is a good compromise that promotes the free market," said the group's Kansas state director Jeff Glendening. "We support an energy policy that allows the free market to decide which energy Kansans consume. Wind has a role in the mix. An electric market free of mandates is most efficient."